Matatus - the ramshackle public minibuses seating between 14 and 24 people that zip along the streets of Kenya's capital Nairobi - carry a third of the city's residents to and from work each day. The journey from the city centre to the working-class suburb of Rongai takes between 45 minutes and two hours, depending on traffic. Hydrogen: The car fuel of the future? Could power plants of the future produce zero emissions? Yet inside the "Ferguson" matatu - named for its colourful images of the former Manchester United manager - half a dozen passengers seem oblivious to the length of their commute. Instead, they sit glued to their smartphones, checking the latest news, YouTube videos and catching up on emails. Ferguson is one of more than 1,000 matatus in the city now equipped with free wi-fi for passengers to enjoy through a service called Vuma Online, launched this April by Safaricom, Kenya's biggest telecom company. 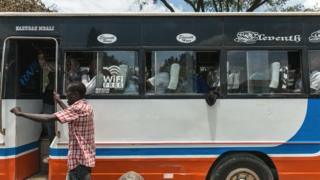 The goal, according to Kevin Bett of Safaricom, is to "convert [passengers] to internet users". But for matatu drivers and conductors it's giving them an edge over intense competition for passengers. "We get more passengers," says Victor Njuguna, a Vuma-equipped matatu conductor. "They actually wait for our bus - they want to enjoy free wi-fi." Nairobi is East Africa's economic, business and technology hub. It has grown from half a million residents in the 1970s to more than three million today. It has grown outward, not upward resulting in an unplanned semi-urban sprawl. It is perhaps no surprise then that the city ranks as the fourth most painful commute in the world, according to IBM's Commuter Pain Index. The government estimates that traffic jams cost the economy more than 50m Kenyan shillings (£365,000; $585,000) per day in lost productivity, fuel consumption and pollution. While the government has ambitious plans to build new roads and bypasses for the city, and even establish a mass rapid transit system and rapid light rail by 2030, progress, like the traffic itself, seems painfully slow. Though Nairobi's commute is dreadful to most, for some of Kenya's burgeoning "silicon savannah" techies, it's an opportunity. "Commutes can be up to three hours long," says Jeremy Gordon, chief executive of FlashCast, a Kenyan tech start-up. "That's a captive audience whose time is pretty under-used." Launched in 2012, FlashCast has designed a location-based advertising system for buses and matatus, using a red LED marquee display connected to a GPS unit and 3G modem installed in the vehicles. Yet advertising alone can be boring. "If we can't make it an entertaining, engaging experience, it's not worth it for them," explains Mr Gordon. "We also display news headlines, short quizzes, games, word scrambles and discussion topics." For example, in April they asked riders on selected buses to nominate the #BestDressed Passenger on the bus. The replies ended up being a huge hit, with responses such as "Red lipstick grey top blue jeans seated back seat next 2 the window on the left side. #pliz…"
"People have a desire to be stimulated when they're sitting in traffic," says Mr Gordon, "so it's a win win." It's also a win for the vehicle owners, since they earn a share of the advertising revenues. However, entertaining commuters - and occasionally helping them hit on each other - isn't the only service FlashCast offers. Since its GPS units track vehicles in real time, it is making that traffic information available through its Android mobile app so that customers can track the location and movement of certain buses, to help figure out which route to take to beat the traffic. Traffic delays are just one part of Nairobi's commuter woes. A greater problem lies in the structure of the public transportation system itself - a semi-formal and chaotic set-up of 20,000 privately owned matatus and buses. Although in theory there may be set prices, the market forces of supply and demand come into play. So if it rains, for example, prices go up. And since passengers pay cash fares directly to drivers or conductors, the matatu and bus owners have no way of knowing how much profit their vehicles are making. As a result, owners simply demand a flat daily fee from their staff, with the remaining profits split between the driver and conductor. While in Europe and other parts of the world prepaid cashless systems for public transportation are the norm, in Nairobi cash is still king. Yet that may be about to change. In May, Google launched a cashless, prepaid card system for the city's public transport, called BebaPay. Conductors are equipped with small, NFC (near-field communication) enabled smartphones. Passengers simply tap their BebaPay card to the phone. Money is then digitally transferred from the card to the phone, and passengers get a message on their phone confirming the transaction. The physical BebaPay cards can be purchased and topped up with credit at various locations across the city. The service doesn't require a bank account - just a Google account - and the cards and phones work without an internet connection. "Cashless will lead to greater transparency, accountability, organisation… and ultimately better public transportation infrastructure," says Denis Gikunda from Google's Nairobi office. Image caption The best or worst seat on a matatu? BebaPay is part of Google's broader strategy to "simplify payments", he says, and improve lives of people in emerging markets. "Transport was a great place to begin, because it captures all the problems - a lot of transactions, frequently, all cash-based." Eventually, he says, BebaPay will not just be used for transportation, but for payment services across the city - from taxis, to public toilets and small retail kiosks. These high-tech solutions are certainly helping commuters in various ways, but few address one of passengers' main concerns - safety. The World Health Organization's Global Status Report on Road Safety estimates that there were nearly 8,500 deaths from traffic incidents in Kenya last year. One-third of all fatalities are passengers, many a result of "unsafe forms of public transportation". The finger is often pointed at reckless matatu drivers. "What [passengers] want most is safety - to arrive at the destination in one piece," says Simon Kimutai of the Matatu Owners Association of Kenya. For that, he says, what Nairobi needs is better fleet management to monitor activity, and vehicles fitted with gadgets to monitor speeding, so owners can react. Yet more simple methods may also be effective. An initiative called the Zusha Project, funded by Georgetown University, recently randomly assigned stickers to the passenger cabs of 2,500 matatus around Kenya, with mottos such as "stand up and speak up" against bad driving. The idea was to get passengers to complain directly to the drivers about their reckless driving. After looking at aggregated insurance data, the project found matatus with stickers were in fact half as likely to get into accidents. As Billy Jack, associate professor of economics at Georgetown University who was part of the project, puts it: "Sometimes it's a low-tech solution that works the best."